These vessels are modified medium ships with a raised fighting platform in the middle of the deck, effectively making them floating siege towers. In theory, the siege tower bune moves close to an enemy ship where the crew is already fighting against boarders, and then rains death down upon them. The vessel is vulnerable to fire and cannon attacks, but it can use its speed to take evasive action when boarding attacks are made against it. In 1590, Toyotomi Hideyoshi used tower bunes during his siege at Shimoda, a coastal fortress controlled by his rivals, the Hojo. Although it was unusual to lay siege to a castle from the sea, the attack used the same tactics as a land assault. The castle’s supplies were cut off, and Hideyoshi waited for starvation to force the Hojo to submit. 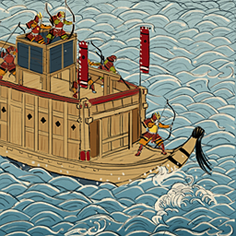 Though Hideyoshi had 14,000 men, the 600 Hojo warriors held out for four months! High tower allows crew to fire down onto enemy decks. Vulnerable if boarded by bigger ships.